According to research scientist Stephanie Seneff, PhD, autism – which she calls “the most pressing disease in the world today” – could affect 50 percent of the children born in the United States by the year 2025. And, although many in the corporately-controlled scientific community roll their eyes at such a warning, Dr. Seneff believes that glyphosate has a lot to do with the problem. To arrive at her chilling prediction, Dr. Seneff reports that she merely extended the exponential curve that the U.S. Centers for Disease Control and Prevention (CDC) has employed in their research on rates of autism spectrum disorder over the past three decades. In 2014, the CDC released data on the prevalence of autism in the United States, reporting that the condition affects one in 68 children. Don’t miss the next NaturalHealth365 Talk Hour, when Jonathan Landsman and Dr. Seneff expose the ugly truth about glyphosate – like you’ve never heard before and why the chemical companies desperately want to hide this truth. Glyphosate, which has been classified as a “probable carcinogen” by the World Health Organization (WHO), was originally developed as a heavy metal chelation agent, intended to clear pipes. It was then patented as an anti-microbial agent – before eventually being employed as a weed-killer. Pervasively used in agriculture, glyphosate is routinely sprayed on wheat, soy, corn, canola oil, beets, peanuts and legumes to increase yields. 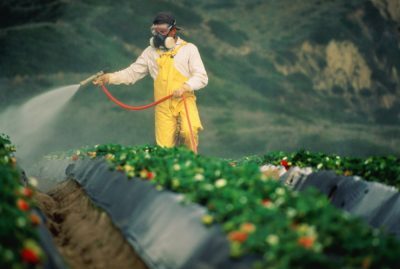 In fact, all food that is not organically grown ends up getting sprayed with glyphosate at some point. And, important to note, because glyphosate is absorbed by every cell of the plant, it can’t be rinsed off or removed. Plus, equally disturbing, some scientists believe that the effects of glyphosate can combine with other toxins to increase harm exponentially. For example, Dr. Seneff warns that glyphosate disrupts hormones, interferes with the metabolism of cholesterol, impairs the liver’s ability to detoxify the body and disturbs the vital balance of the gut microbiome. To make matters worse, glyphosate causes red blood cells to maintain low levels of vitamin C – leading to atherosclerosis and heart disease. It also causes fatty liver disease by disrupting fructose metabolism, as well as disrupting sulfate synthesis. By interfering with a specific pathway used by beneficial microorganisms in the intestinal tract, glyphosate can cause deficiencies in amino acids and affect the function of neurotransmitters. These can include serotonin, dopamine and melatonin – chemicals needed for stable mood and a better night’s sleep. When it comes to minimizing the harm from glyphosate, eating a certified organic diet is probably the most significant action you can take. (Merely being labeled “non-GMO” or “natural” is not enough. And, when dining out, look for “organic” and “grass-fed” options). Nutrient-rich foods such as wild-caught seafood and organic eggs are ideal for glyphosate detox, says Dr. Seneff. You should also strive to eat healthy amounts of probiotic foods – such as yogurt with live cultures, sauerkraut juice and other naturally-fermented foods. Cruciferous vegetables – such as Brussels sprouts – can supply much-needed dietary sulfur, and bone broth made from grass-fed cows can help restore depleted minerals. Another wise choice is to consume as many greens, herbs and spices as possible such as, onions, garlic, parsley, basil, cilantro and dandelion greens. To assist with a glyphosate detox, an experienced integrative healthcare provider may also recommend sulfur-containing supplements, such as alpha-lipoic acid and MSN (methylsulfonymethane).